Notice when you go into church on Pentecost Sunday, the changes in colors in the sanctuary. Red is the color of Pentecost, and it signifies the tongues of flames seen over the heads of those praying together. The Scripture also tells us that the sound of the blowing of a violent wind filled the house where Jesus’ followers were praying. 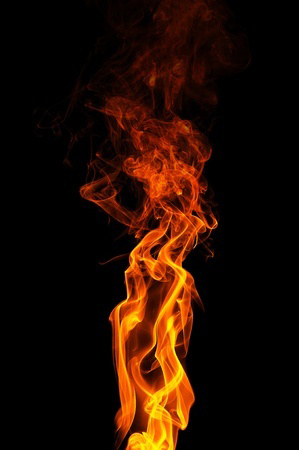 In addition to the color red, churches often display tongues of flame and symbols of wind on banners and posters. While having home observances for Christmas and Easter is common, Pentecost often goes unobserved in our homes. However, without Pentecost, we wouldn’t have the church. It is worthwhile to spend time in family devotions and celebrations for this church holy day that helps us remember how the church began. What can you do in your family to observe Pentecost? Read together Acts 2:1-40. Ask each family member to tell of one thing he or she will try to remember from the Scripture reading. Pretend you are Peter and are delivering that first sermon. What would you say to people today to help them understand the message of Jesus? Make a Pentecost cake to celebrate the birth of the church. Tint icing red and decorate. Place candles in clusters to symbolize the flames. Enjoy wind activities together. Make and fly a kite. Sit outside at dusk and feel the wind on your faces. Blow bubbles and watch as the wind carries them in the air. Visit an older member of your church. Ask your church friend to tell you about memories of how the church started, memories of Sunday school, and memories of people who were important to his or her faith formation. Decorate your home by making red banners, posters, or pictures. Attend worship on Pentecost Sunday and wear something red. Gracious God. We are reminded again when the first believers in Jesus were given the courage to tell others about Jesus. We believe you give us that same courage to tell others about Jesus through the power of the Holy Spirit. You know, O God, that sometimes we are fearful and we feel alone. But just like that Pentecost long ago, we, too, are surrounded by your love and presence. Help us live in such a way that others see in us a reflection of your love. Help us have the courage to tell others about the difference it makes in our lives to trust in your love and care. Help us see those around who want to be in the fellowship of Christians. Help us to witness to one another so that we grow in faith. Through the power of your Holy Spirit and the witness of your son, Jesus the Christ, we pray today. Amen. Mary Jane Pierce Norton is retired from the staff of Discipleship Ministries.